The chart below highlights the current level of large Class A blocks of office space available by submarket. We consistently track this metric, and it has not moved appreciably in the last few quarters. That is not to say demand has been lacking. In fact, most of the recent absorption has been taking place in the newest developments. Categories: Agency, Agency Leasing, Chart of the Week, JLL, Office Tenant Representation, Research and tagged Chart of the Week, Research, Walter Bialas. 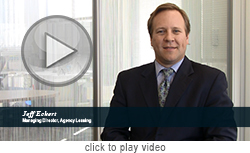 Hear from Walter Bialas, Vice President, Market Research Director, and Jeff Eckert, Managing Director, Agency Leasing, about the Dallas office market. View video. Categories: Agency Leasing, Branding, JLL, Research. Categories: Agency Leasing, JLL, Research and tagged Construction, Corporate Relocation, Energy Prices, Job Diversity.